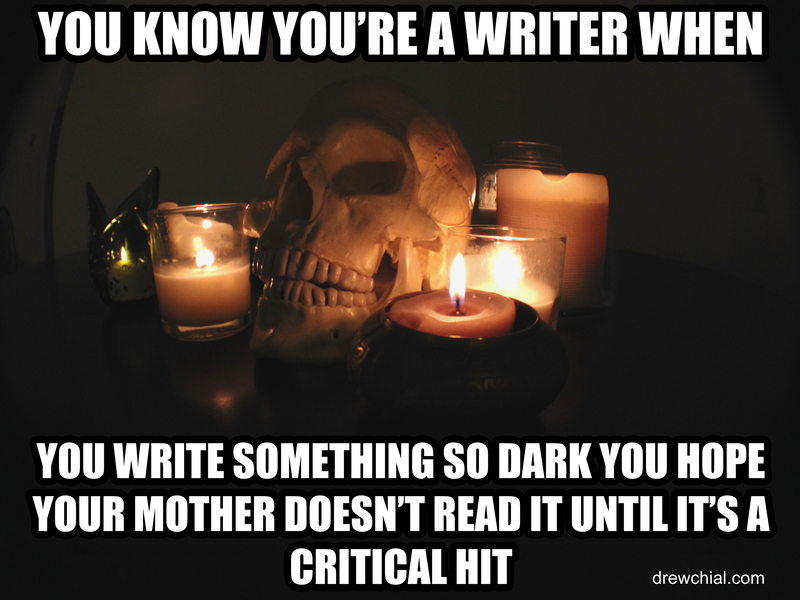 You know you’re a writer when you realize that you have some form of psychic ability. Your words are telepathic messages. You can communicate with people you will never meet, in places you will never go, in eras you will never live. You can get inside their heads, make them see what you want. You can evoke emotions and plant ideas. You can change minds. 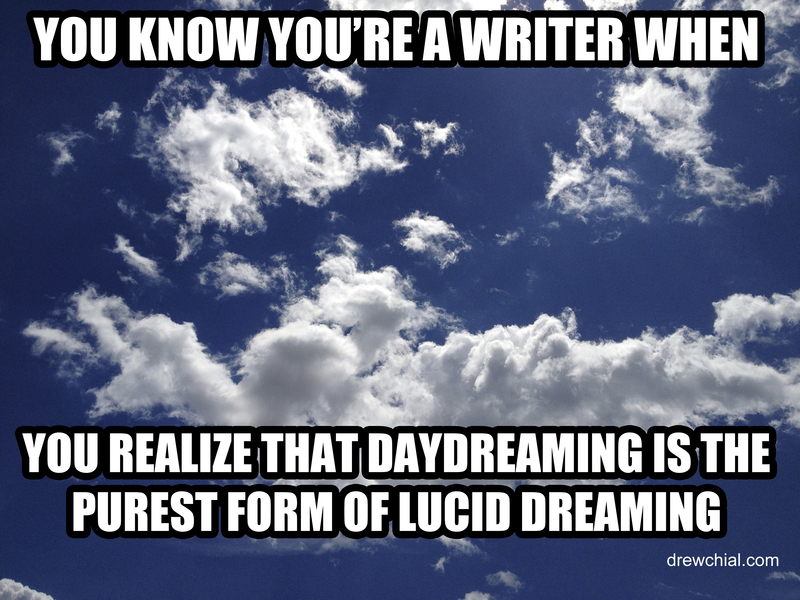 You know you’re a writer when you realize that daydreaming is the purest form of lucid dreaming. That reality is subjective, that it’s within your means to change it, to doctor the record after the fact. You know you’re a writer when you go from dabbling with an outline, to compulsively refining a novel. You know you’re a writer when you steal away like a drug lord with a second cellphone, like a spouse concealing graphic sexts, or a politician trying to dodge a blackmail scandal. Inspiration strikes and you have to answer the call. If you’re on the clock, duck into the bathroom, hide behind the coat racks, or crawl beneath your desk. You’ve got to jot something down before it evaporates. That clever phrase won’t last long on ice. You’ve got reach for your notepad, type on your phone, or scrawl the words across your arm. HR might call that time theft but that’s their corporate culture. You’re the counterculture. You’ve got a secret life to attend to. 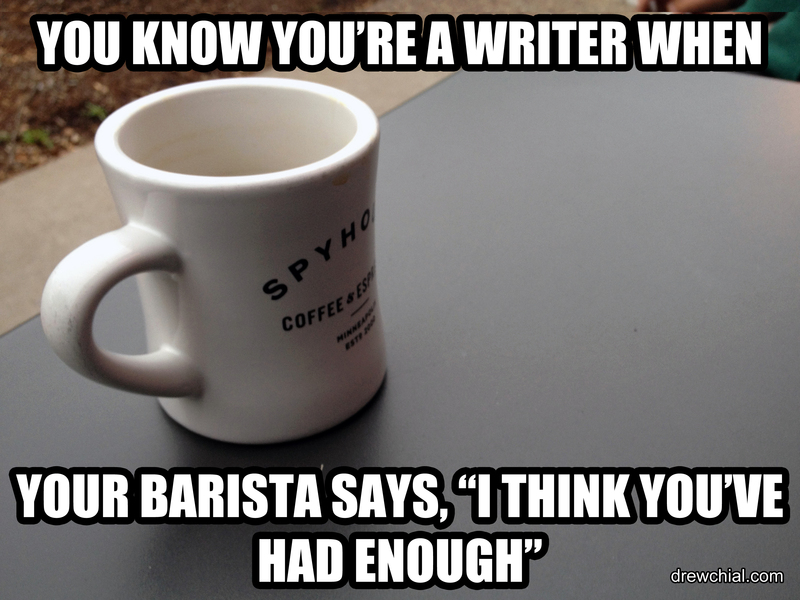 You know you’re writer when you realize that your thoughts have value. That there ought to be a record of them. That immortality is an attainable goal to a scant few that are bold enough to go for it. 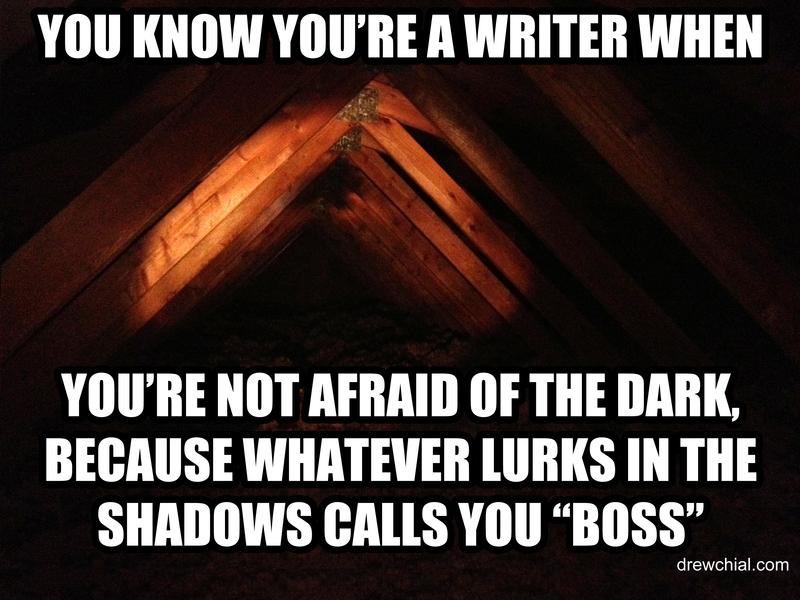 The first time I saw the #YouKnowYoureAWriterWhen hashtag was in a post by @KMWeiland. She writes advice for writers working to becoming authors on her website. She deserves the credit for introducing it to me. 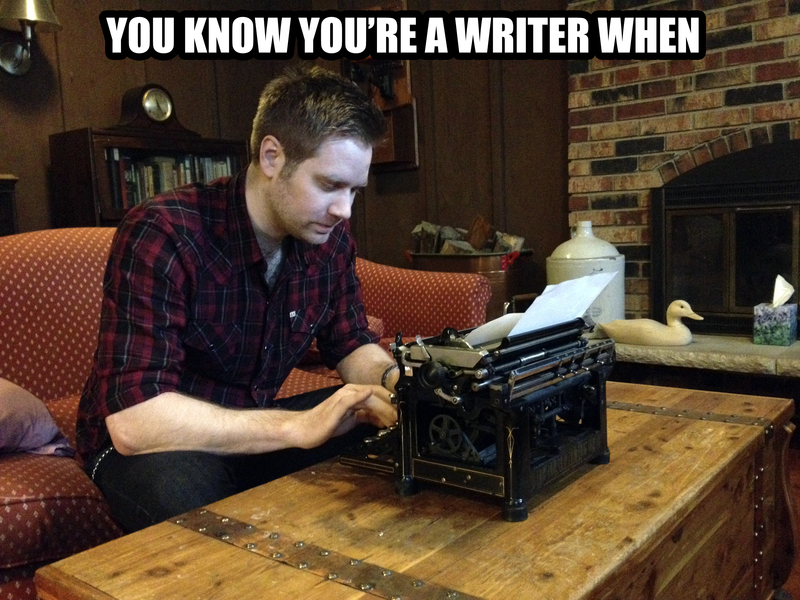 On Twitter #YouKnowYoureAWriterWhen has been my goto hashtag. It’s a quick way to spark my creativity on a fifteen minute break. It’s a springboard for conversation. It gets me thinking about my process. Sure it’s riff on Jeff Foxworthy, but it’s come to mean something important to me. I’d like to see more writers using it. Giving credit where credit is due, this post is the brain child of Jessica West (@Wes1Jess on Twitter). I’d been posting these for over a year. She suggested that I post a collection. This is the first part. you share your mental real estate with your characters and it’s starting to get really crowded in there. you feel like a shark swimming across a keyboard, if you stop typing you’ll die. you have an inventory of rude character attributes that the real world keeps helping you add to. you start a quote with, “who was it that once said” until you realize the quote came from you, you genius. you realize that entertainment without enlightenment is a waste of time. you interject, “I just wrote a story about that subject,” into casual conversation. 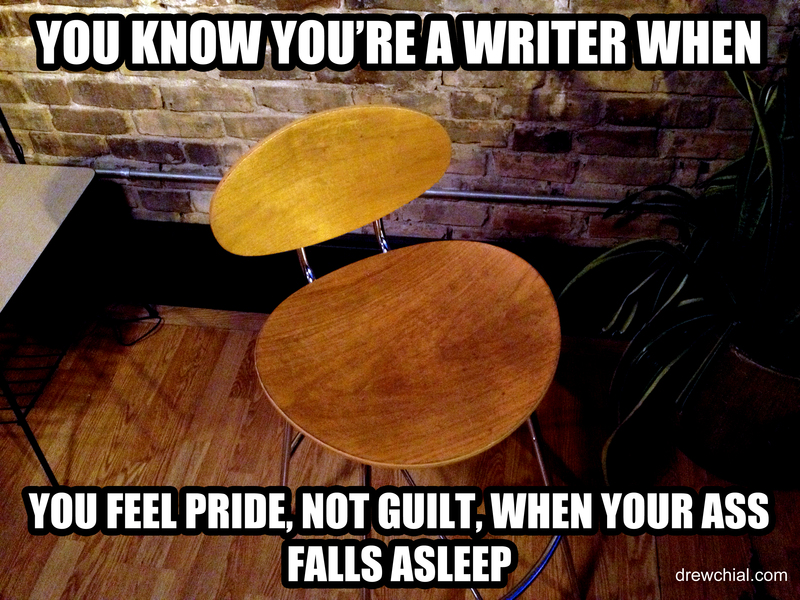 you feel guilty for fulfilling your basic human needs like sleeping & eating when you haven’t written yet. you can successfully make a character sound more intelligent than you actually are. you’re afraid people will figure out when you’re telling the truth. When a line of dialogue is too specific and a little too authentic. you know what not to describe, what action not to include & when to cut a scene. you can convince someone that you remember your childhood, because you know how to fill in the missing details. 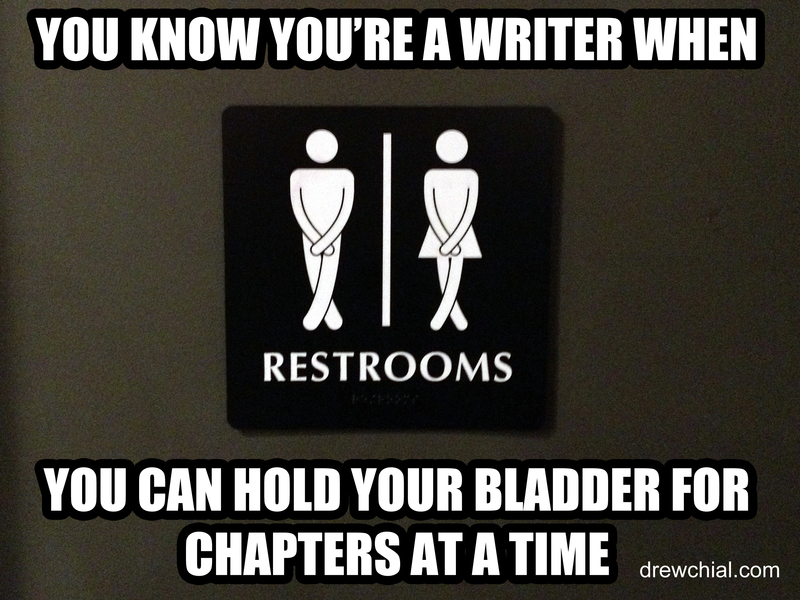 you drain your bladder far more than you would ever need to. 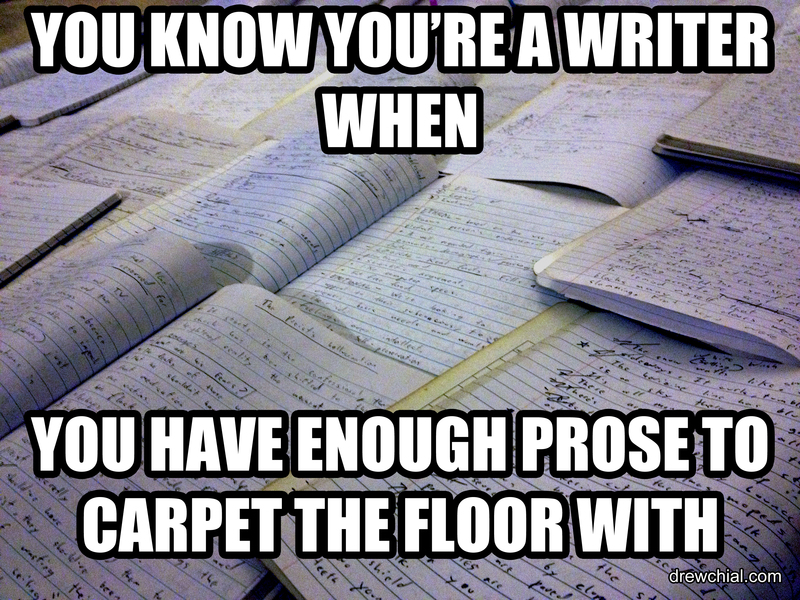 you scrape your nails across the desk while you wait for your word processor to finish loading. you saw a movie trailer and imagined a far better movie than the one you eventually saw. you wake up and start typing before your mental grammar, spelling, and punctuation systems have time to power on. someone mistakes a work of fiction for a journal entry & confronts you about it. you write your resumé cover letter as a narrative. you know what your characters are up to when they’re not on paper. it doesn’t occur to you that you haven’t spoken to another human being all day. A real one anyway. You start writing the description of location knowing the plot will be around eventually. You can adapt your fan fiction into a stand alone franchise without anyone naming your influences. You start to fear things that you made up. have to delete a metaphor because you’ve used it 3 times already in the same story. Google completes sentences for you, like, “What do you call the topmost part of a tree?” It’s the “crown” by the way. You find plot holes in real life and you call people out on them. 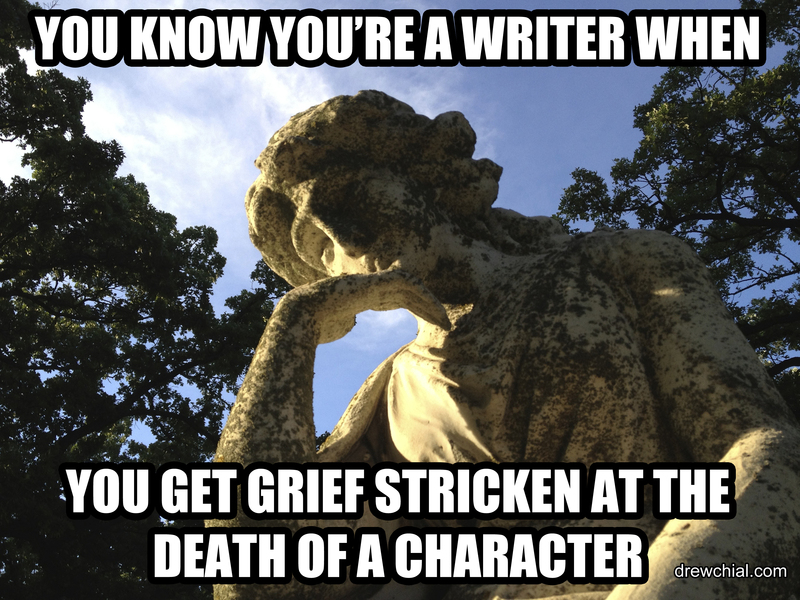 You fear for a character’s life because you know their death would make the story much more interesting. You can remember your protagonist’s scars by heart, but can’t remember if you’ve brushed your teeth yet. 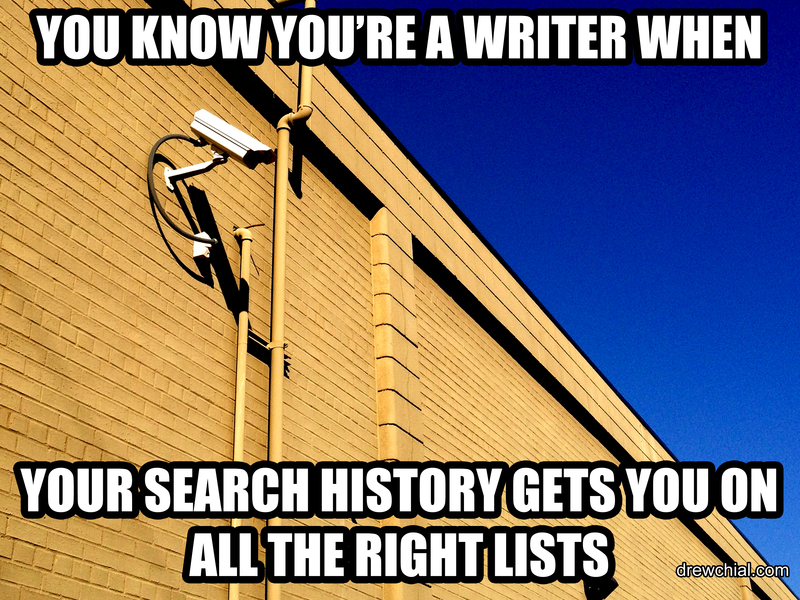 spend an hour Googling to see if someone’s already written a story about that. you alter a major plot point in the middle of your pitch and you don’t even skip a beat. you can’t listen to a song without thinking of a scene to go with it. there’s a couch, chair, or love seat with your groove on it. 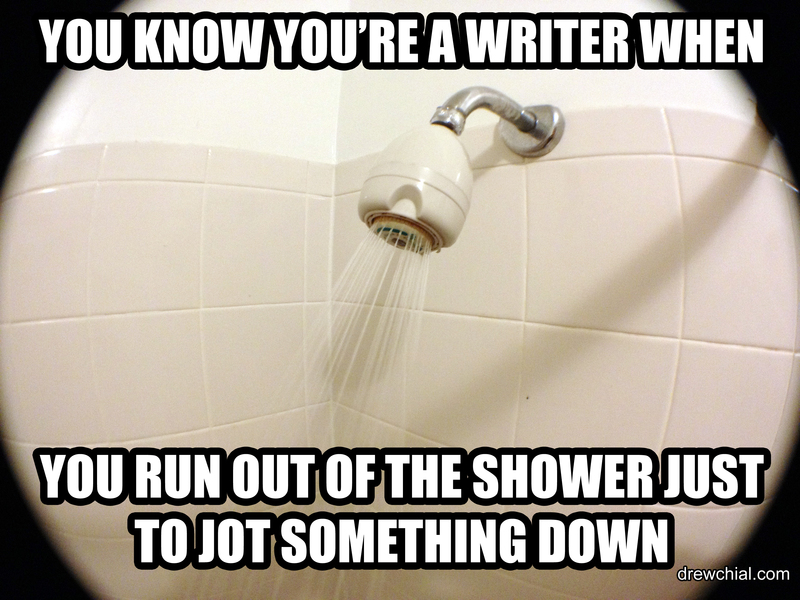 you run out of the shower just to jot something down. your characters hear the ominous voice of the narrator & get into an argument about their future. you plagiarize your own journal entries for dialogue. You write a terrorist plot and your fiction becomes a matter of national security. can put in 1,000 words in an evening and still claim to be blocked. I never said they were good words. Thanks, Drew, this was entertaining. Yeah, I love my Twitter family. They’re a source of much inspiration. Thanks, Drew, this is great! Thank you. 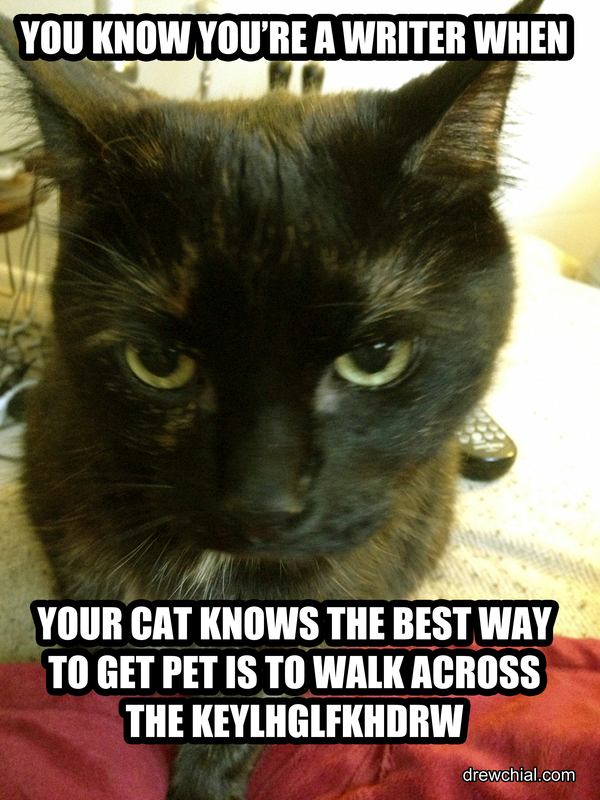 I was really uncertain about this sort of post, building my own little meme, finding the right font, and all that. I’m really glad you liked it. This is fantastic! I’m so happy you ran with this. I’m giggling at my computer screen at 7am like a crazy person. Thanks for the shout out. Any day my name is mentioned in a Drew Chial article is a damn fine day. That last bit really got me. A top 10 list would be the most popular post, right? Well done. Can’t wait for the next part. Tip of the hat, Drew, well done sir. I definitely relate to the last one, especially where it concerns my Huffington Post output. Of the 24 articles I’ve written for them, covering territory as diverse as environmentalism, suicide, literature, politics and charity, the one that got the most attention was a missive on the quirks of air travel. 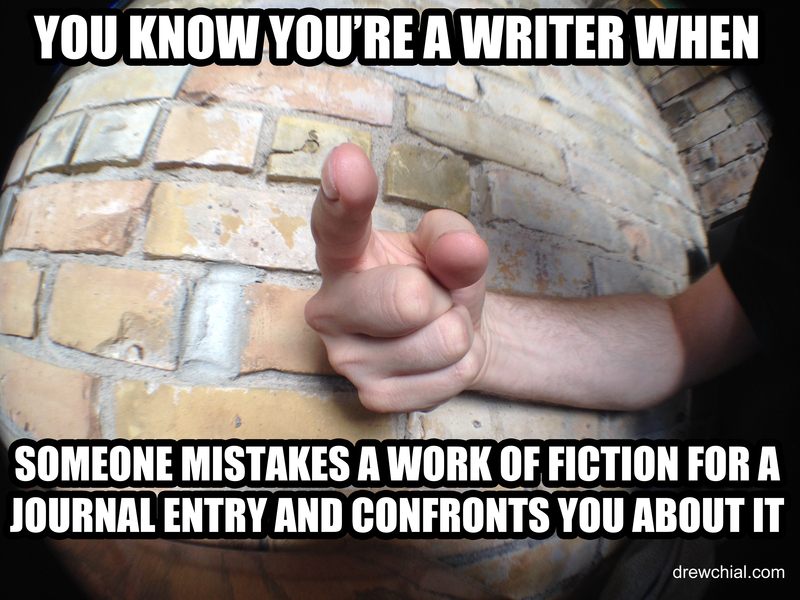 Face, meet palm, meet You Know You’re A Writer When. That’s exactly how I feel. 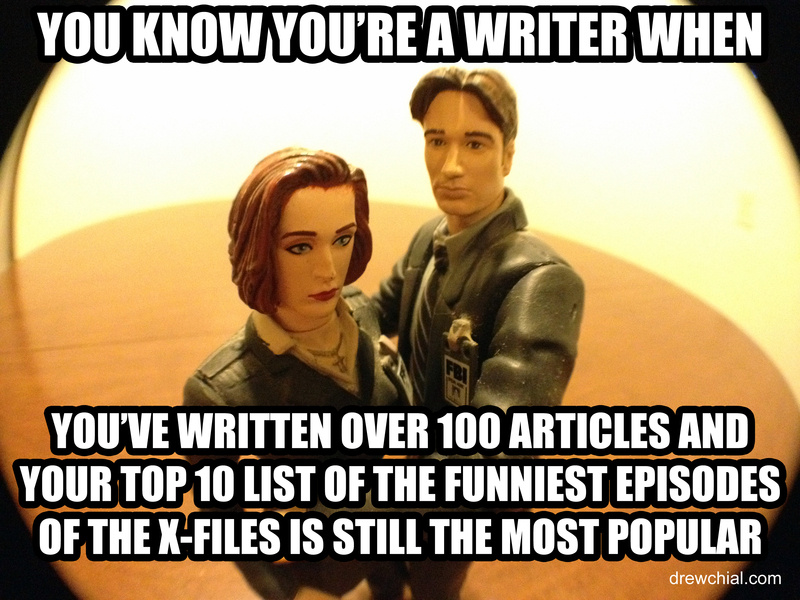 I wrote my X-FIles top 10 lists to get myself into the Halloween spirit. At the time, I didn’t know what else to write about. Now I’ve written things I’m proud to stamp my name up, but that cute little X-FIles list out performs them nearly everyday. Good thing I genuinely love that show. Great post. Thoroughly enjoyed it. I totally plan on sharing these individually all over my twitter account. I am pleased you left your URL on them. Maybe we’ll get you some more attention.!! By all means share them, and don’t be afraid to create your own too. This was the first time it occurred to tag my photos with my url. I wanted people to know that I wasn’t stealing someone else’s photos and putting my own words over it. The memes are spot on. The cat on the keys had me laugh out loud. I think they’re awesome and you should keep them coming. By all means, please do. I cite you as the inspiration for the whole collection. Thanks for checking them out! I loved the one of the cat, the grieving because of the character´s death, the one of the voice calling you “Boss” . 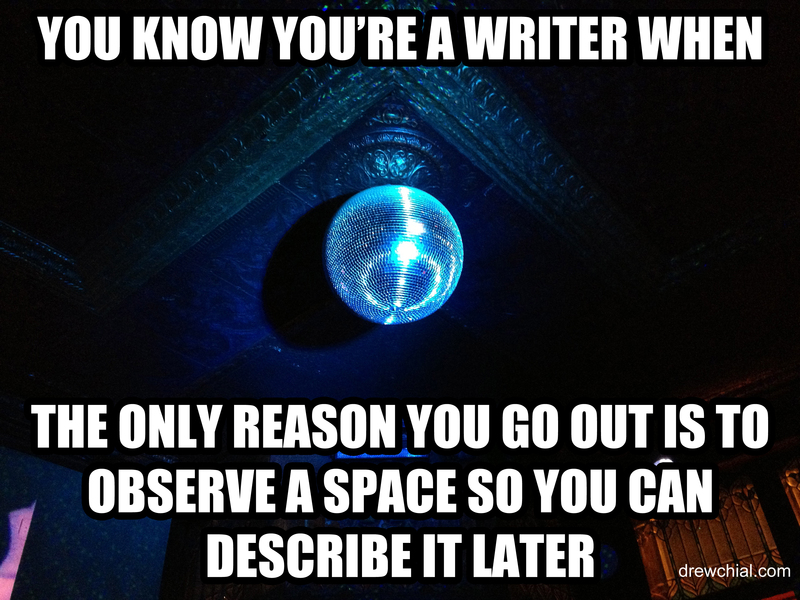 That other one in which you say that the only way out to “go out” just to pick up new ideas for the plot…And so on..
OMG. That was awesome! Completely made me giggle. I will be re-reading this for inspiration and to help me not feel so bad when I tell my family I am “just going to write for 20 minutes” and they all look at each other knowing they might not see me the entire weekend save for them damn bathroom breaks. Ha! I so needed this, thank you! Can’t wait to check out more of your blog site. Thanks for checking these out. 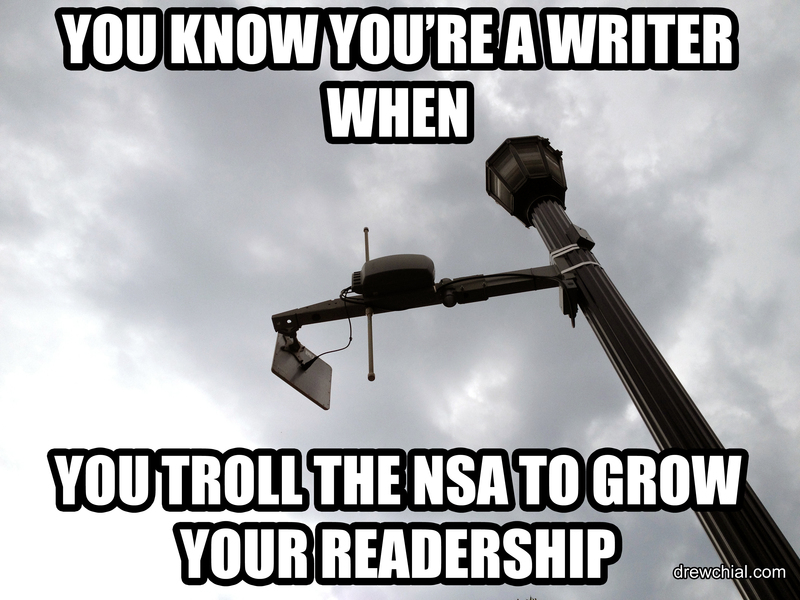 I post new #YouKnowYoureAWriterWhen posts on Twitter every day. I’m going to add more to this gallery soon.